Home > Staff > Gladwin Joseph, Ph.D.
Gladwin Joseph was born in a town called Nazareth in Tamil Nadu, India, but has lived in Ghana, India and the USA. He was until recently the Director and Professor at the School of Development, Azim Premji University (APU), Bangalore, India. Prior to that, he was a senior leader of Ashoka Trust for Research in Ecology and the Environment (ATREE), an Environmental think-tank and academic institution. He was its director for 10 years and with its founding president helped build and establish ATREE as a premier conservation and sustainability organization in India. His publications span a diverse range of topics from plant ecophysiology to conservation and livelihoods. 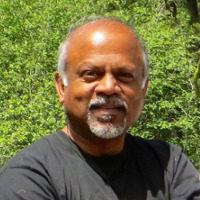 After finishing a degree in Agriculture in India from the University of Agricultural Sciences, he completed his MS and Ph.D. at Oregon State University. He helped initiate the development of an online course on sustainability for the global south for undergraduate students at APU. He continues to advise and provide inputs on course design as a visiting faculty. In his spare time he is actively involved with the open source Indian Biodiversity portal, particularly the treesindia group which is working on a citizen science project documenting all of India’s tree species. He is also working on an easy-to-use bilingual (English-Spanish) pictorial guide to trees of Oregon. He continues to serve on Ph.D. student advisory committees as an adjunct senior fellow at ATREE. His hobbies include gardening and cooking with his kids, keeping track of global news, reading books on history, culture and religion, hiking, and fly fishing. CBI is supporting Geos Institute and partners in Canada as they map, assess and protect primary and intact forest landscapes.